There is an open position for a PhD at Aviz-Inria in France. They are looking for someone to work on a project on the interesting topic of Structural and Functional Visualization of Brain Connectivity. The project combines the best of both worlds with a mix scivis and infovis approaches. Does this sound like your type of project? If so, keep in mind the application deadline is August 1, 2015 and start working on your application. More information on the project and the position can be found in this pdf. Every two years the VCBM group awards the Karl-Heinz Höhne Award for Medical Visualization (medvis-award for short) to a young scientist in the MedVis field. Candidates for this award focus their innovative research on visualizations clearly related to medical questions. In third place: Cees-Willem Hofstede (Delft University of Technology) for his work on the Online Anatomical Human: an online anatomy browser, which allows combined display of medical images and reconstructed 3D models of various anatomical structures. 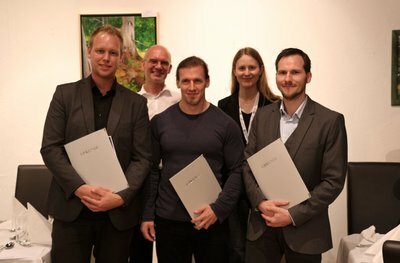 In second place: Frank Heckel (Fraunhofer MEVIS) for his work on interactive correction of segmentation results, such as delineated tumors in CT-scans. In first place: Benjamin Köhler (Universität Magdeburg) for his work on the quantification and visual representation of blood flow data in cardiovascular disease. Karl-Heinz-Höhne Award (MedVis- Award) winners: from left to right: Cees-Willem Hofstede, Benjamin Köhler and Frank Heckel in the front row. Dr. Stefan Zachow and Dr. Dorit Merhof in the back row. We would like to congratulate the winners with their well-deserved awards! Advanced Medical Visualization tutorial at MICCAI 2015! Bernhard Preim (University of Magdeburg, DE; author of and driving force behind the MedVis book) and Anna Vilanova (Delft University of Technology, NL) are organizing a tutorial on Advanced Medical Visualization at MICCAI 2015, one of the most important technical medical imaging conferences in the world today. Judging by the list of topics and especially the list of speakers, I expect that this is going to be a great tutorial. If you’re going to MICCAI 2015, don’t miss this! 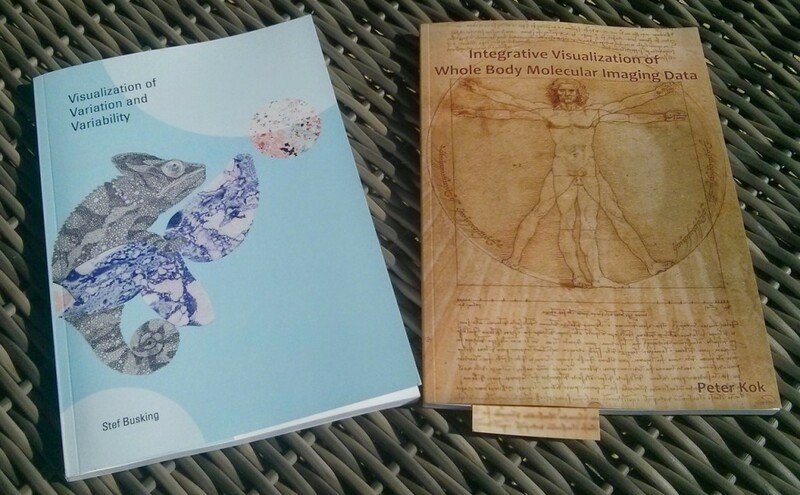 In the spirit of better late than never, the Eurographics Workshop on Visual Computing for Biology and Medicine (VCBM) 2014 conference report, summarizing some personal highlights. At VCBM 2014, we tweeted a picture for every talk and then some, which was arguably a bit much, but still a lot of fun. The VCBM organization also posted a great recap using Storify at their website. Given the theme of the conference, almost every talk is relevant to our medical visualization interests, but I would like to briefly summarize only a couple of them here. The benefit of delaying so long in writing this is that there are a lot of videos online by now. I will try to let the videos speak a 1000 words where available instead of getting too verbose. Onwards to the highlights! A day before the start of VCBM itself, the VCBM fachgruppe (working group) had a meeting with six interesting talks. This was followed by a social event, a guided tour of the Narrenturm. 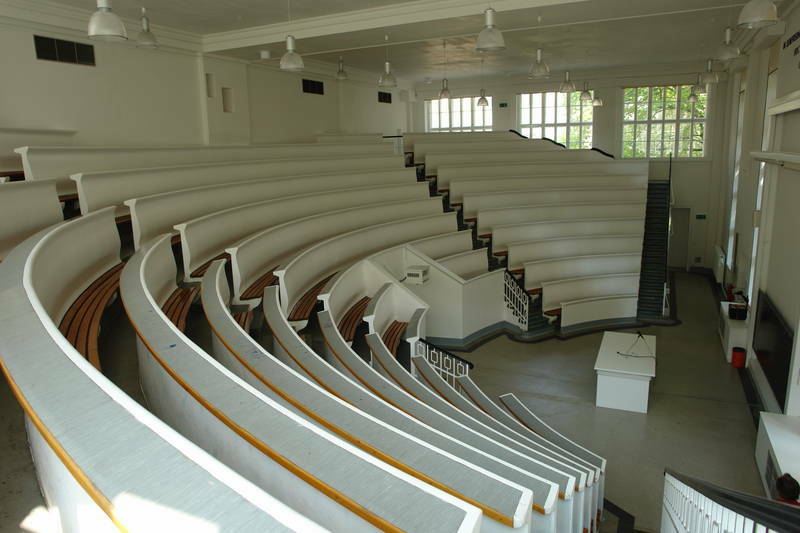 Built in 1874 to treat mental patients, it now serves as a museum for the Pathologic-Anatomical Collection. The Narrenturm features a huge collection of moulages. These are wax models of diseases made based on real patients and used in medical education, which is cool and slightly creepy at the same time. This tour was followed up by a delicious dinner at Unibräu for those who didn’t lose their appetite after what they had seen during the tour. PC-MRI Data” . Four-dimensional phase-contrast magnetic resonance imaging (4D PC-MRI) is a relatively new modality that can acquire non-invasive, time-resolved, three-dimensional blood flow information. Benjamin proposed robust quantification techniques to assess cardiac function in this data. variations in pharmacokinetic parameters. For this application, she created a visual representation, the Cocoon, by integrating perpendicularly Parallel Coordinate Plots (PCPs) with Cobweb Charts (CCs). A demo video is available here. determine and visualize a segmentation boundary. Additionally, a novel visualization method was presented, specifically designed to simultaneously provide information about 3D morphology, confidence and possible errors. I would love to tell you who the winner’s were, but the official announcement has not been made yet ;), so I don’t dare… Congratulations to the award winnners nonetheless, you know who you are ^^. involved in deploying visual computing solutions in a hospital setting. The honorable mentions can be found here. Our congratlations to the authors! Ivan Viola closed the conference and announced the location for next year (this year by now ^^): VCBM 2015 will be held in Bangor (UK) and will from now on be an annual workshop instead of bi-annual (once every two years, not the twice every year-type). To conclude this summary, I’d really like to thank the organizers of this excellent workshop. Interesting talks, a beautiful location, good food, great people once again! We have received word from Bilal Alsallakh that the University of Bergen is looking for a PhD student in visualization. The exact topic of the PhD will be decided on with the advisor, but biomedical, visual analytics and visual computing are among the list of possible topics. More information about the position is available here. Alternatively you can skip to the full advertisement here and a factsheet here. The application deadline is the June 1, 2015, so do not delay and apply now if you are interested in this amazing opportunity. Dr. Mathias Goldau successfully defended his PhD at the University of Leipzig. His thesis is entitled ‘Multi-modal and Slice-based Visualizations of Diffusion Tractography Data’ and you may or may not already be familiar with his work on OpenWalnut, an open source tool for multi-modal medical and brain data visualization. The full text of the thesis can be downloaded here or take a look at his publications here. Dr. Peter Kok successfully defended his PhD at the Technical University of Delft. In his thesis, ‘Integrative Visualization of Whole Body Molecular Imaging Data‘, Dr. Kok present methods to map molecular imaging data to a common reference frame, to combine multiple modalities and to compare scans taken at different timepoints. The full text of the thesis is available here. Dr. Kok with his paranymphs and the thesis committee members. tblr: Jos Roerdink, Elmar Eisemann, Charl Botha, Erik Jansen, Boudewijn Lelieveldt, beadle Rina Abbriata, Louise van der Weerd, Bernhard Preim, Noeska Smit, Peter Kok, Thomas Kroes and the head of the committee. On the same day, Dr. Stef Busking successfully defended his PhD at the Technical University of Delft as well. His thesis, ‘Visualization of Variation and Variability‘ deals with comparative visualization as a means to analyze variation or variability based on two or more specific instances of the data. The full text of the thesis is available here. Congratulations to all three doctors! First up, on Thursday December 11th, we will have a special medical visualization colloquium (open to the public). This colloquium will feature two invited speakers, Prof. Dr.-Ing. Bernhard Preim and Prof.dr. Jos Roerdink, presenting recent work on ‘Visual Analytics in Cohort Study Data’ and ‘Prediction of Neurodegenerative Diseases’. More information about the colloquium and the abstracts for the talks are available here. Secondly, on Friday December 12th, Peter Kok and Stef Busking will be defending their PhD theses. Peter Kok will present and defend his work entitled ‘Integrative Visualization of Whole Body Molecular Imaging Data‘ starting at 9.30 am in the TU Delft Aula. Afterwards, at 12:00 pm Stef Busking will present and defend his work entitled ‘Visualization of Variation and Variability‘ in the same location. The theses that will be defended next week. Picture courtesy of Charl Botha. Previously, we reported on two open positions in the context of the VAnPIRe, Visual Analysis in Population Imaging Research, project. The PhD position has since been filled, but the PostDoc is still open. More information about the position can be found here. The closing date is at the end of the month, so apply now if you’re interested! We’re currently at VCBM in Vienna. For live updates, check out our Twitter coverage and be sure to check back for a full conference report in the near future! Clinical Graphics, a fast-growing medical visualization company, is currently looking for a Software Engineer to join their team. From their job description: “We make software for the analysis of medical 3D scans of hips and shoulders. This software is used by the company to provide online surgery plans to orthopedic surgeons. Surgeons can predict how well a patient will be able to move after surgery thanks to our analysis service. Surgeons from around the world are sending in their scans for us to analyse. If you’re interested, check out their career page here and the full job description for more details here!